An effective email campaign has one goal and one goal only: getting the reader to respond. This means that, in order to succeed, every word of copy should be focused on selling the offer, i.e. the primary reason why any individual would want to respond. Unless your offer and product are one and the same and the call to action is “buy now,” no-one cares about your product. All that matters is the white paper, the video, the Webinar, whatever it is that is on offer. An email that focuses on the product, or the company behind it, or the brand, will simply read like a product brochure. Along the way you may convince people that your product/company/brand is wonderful, but precious few will do anything about it. 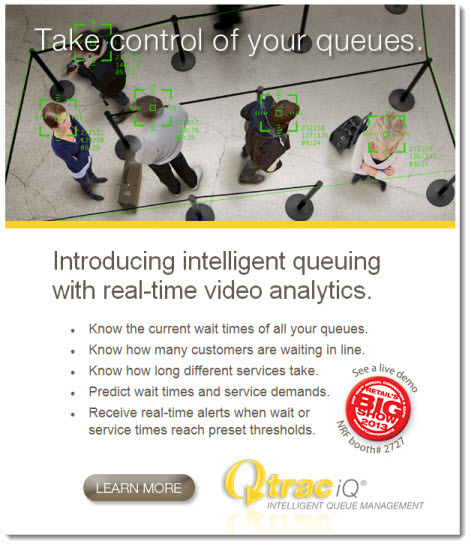 Take, for example, the email below from Lavi Industries, a company whose product, Qtrac IQ, allows brick-and-mortar retailers to report on and analyze customers waiting in line at stores. 1. The subject line (not seen here) is “The latest technology driving the customer experience”. Note the glaring absence of any offer or other action-oriented language (learn, discover, download) that might give the reader a clue as to what he/she might gain by opening the email. Even the language – “latest technology,” “customer experience” – is generic and amounts to precious little. 2. The headline (“Take control of your queues”) sums up the product benefit nicely, and the header image itself is intriguing, though very few readers will spot the green cross-hairs that presumably are a visual metaphor for the product’s main functionality. However, the overriding problem is that anyone with images turned off in his/her email client won’t see the header at all – not the image nor the headline copy. In addition, the header itself is so large that it’s forcing selling copy down the page and below the fold. 4. “Learn more” is the worst possible call to action. What happens when I click this button? Am I requesting contact from sales? Will I be directed to a Website? Am I going to download free product information, view a demo, what exactly? Calls to action must always be 1) specific and 2) tangible – download a white paper, view a demo, register for a free trial. This version fails on both counts. What’s more, the button will be invisible with images turned off, and because it’s not repeated in a text link elsewhere, most readers will see no call to action whatsoever. 5. Ah you say, but there IS a call to action that’s both specific AND tangible – the invitation to see a demo of the product at the upcoming NRF (National Retail Federation) trade show. And were the entire email about that demo, and what you could expect to see and learn when you attend the show, it might work well. But of course, the email is nothing of the sort – and so this call-out is simply a distraction. This entry was posted in B2B Marketing, Copywriting, Creative, email design, email marketing and tagged b2b demand generation, b2b lead generation, B2B Marketing, email copywriting, email creative, email design, email marketing, lavi, qtrac iq on January 8, 2013 by Howard Sewell.